Sure, it bothered him but he wasn’t sure what to do. Pops Haverson could repaint it, of course, but how long would it stay fresh and clean? It wasn’t like it had dirty words or racist drivel or threats, was it? That’s what his wife reminded him as he left their house and also: “It’s not the Ritz, not the best we own, you know.” No, but the painted words spoiled the half-wall, behind which were stairs to a locksmith. The small business owner on the west end of the building hadn’t said a thing. Pops decided to find out who’d made the art work. It’d probably take him weeks or he could call the police–fat chance of anything coming of that–but he didn’t want to do that. He didn’t want retaliation. He had fair relationships overall. And Pops wasn’t a fighting man. For the most part his tenants were decent, hard-working folks; they reminded Pops of himself before he invested in real estate. That is, they were a bit worn thin but full of grit. His twelve tenants liked him enough. No one went out of their way to be real friendly and he didn’t encourage it. Pops believed that you get chummy and before you know it, trouble rolls in. They might want an extra week to pay rent or skip out of their lease, try to get more for their money and then take it personally when you deny them. No, vandalism wasn’t a problem for him before. But inoffensive or not, why that? 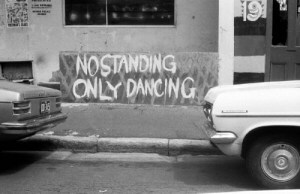 Why paint “No standing, only dancing”? A weird thing to say. What did they mean by that? He’d rarely seen anyone dance in front of his apartments. There were a dozen kids around there (four teens in the building) but they liked to smoke, gossip, watch other kids go by. They sat on that wall a lot. He found busted beer bottles sometimes, end bits of joints, and sometimes a dirty sock or a tennis shoe, a trashed motorcycle magazine. Someone had a thing for Harleys, as the magazines got left behind every few months. So he repeated, Keep the doorway clear, stay off the wall, move on down the street. He even put a hefty trash receptacle by the entrance. He came by once a month to collect rents. Sometimes he’d yell at the group to stop hanging around the door. They’d refused to quit congregating and he’d had enough, so posted a No Loitering sign. That lasted a week. When he came by last week-end the graffiti was there. Some nerve these kids had, he thought as he mounted each step slowly. The tenents had the option of putting their rent check in the mail or waiting until he came first of the month. Usually they didn’t answer their door bells, just slid their envelopes under the door or handed it through a half-inch crack. A few chatted, at times complained more than he wanted. He rapped hard when nobody answered the doorbell of apartment one, floor one. He could hear shuffling, then silence as Della peered out the peephole, as usual. He could almost feel her significant body weight from the other side as she leaned in. It finally opened three inches and one rheumy eye stared at him. Her hand clutched the envelope and he grabbed hold. She held fast. It was her way of resisting, of telling him she was boss. She used to be a high school principal. At eighty-four, she still could have been. Della pulled back, raised her eyebrows and smiled a tight little smile at him, then let go of the rent. He tried to wedge his foot in but she was too fast and slammed it shut. Pops took out his notebook and made a note of it, then rapidly walked to number two. He saw the rent envelope from Jarrod Tuttle held fast in a clothes pin he’d affixed to the door. This was usual. Pops saw all sorts of things dangling from that clothes pin–poetry (if that was what Jarrod wrote), ribbons glued to prayers for ailing strangers he’d read of, seasonal decorations, notes to others in the building. Pops had met with Jarrod twice, when he applied for the place and then paid and moved in. He was up front about having a severe anxiety disorder, couldn’t leave his place much at all. He was on disability. The man was in his forties and hadn’t worked for over ten years. But he kept his place up from what he heard from Della and repair people, and paid on time. Pops took the envelope down, unsealed it, pocketed the check and then wrote in his notebook: Jarrod, if you know who vandalized the building, please get in touch. Much appreciated, Pops. He tore the page out, put it in the envelope and clipped it with the clothes pin. Number three. He rapped on the door hard four times because Thomas Johns never answered door bells. He’d told Pops that he didn’t need to feel like a trained dog. Besides, he knew who was at the door by the knock, usually, and that was interesting to him. That is, if he wasn’t working on web design with his headphones on. Thomas loved classical music, primarily Bach but sometimes Dvorak. Pops liked classic country but why would he care? He never had complaints about Thomas. The door opened. Thomas still had ear phones on and held a bowl of salad in one hand. The other held out the rent check. He was very tall, pale-faced, long-haired. Pops was a rotund five foot six. It sometimes felt as if Pops was reaching up to the lowest branch of a birch tree to snag the check. Thomas laughed, lowered the check, then slid the headphones to his neck. Thomas could be sarcastic but Pops didn’t always know when. He was in his late twenties, he guessed, and was trying to make headway in his field. Self-employed. Della had mentioned that Thomas was about to launch himself “into the stratosphere” as he was getting good offers from companies now. Pops looked behind Thomas. “I see Anton hasn’t moved.” The tabby cat sat on the window ledge in front of Thomas’ desk. Pops laughed. “I need to get a few more cats in here.” But there weren’t mice in this building as far as he knew; he saw to all that. He put his headphones back on and turned away. Pops stepped out and closed the door. That voice zinged him like a shreik. He stumbled up the steps. He was hoping he’d miss Darcy. She was happily tripping down the stairs, a dark red lacy shawl lifting from her shoulders, a rather too-short blue skirt impeding her progress, coppery red hair flying out of a loose bun. She had bright earrings that swung back and forth. Pops instantly thought of the chandelier in his office building downtown. She stopped him with her hand, rings winking in the stairwell light. With a flourish of her shawl– she looked a little like a toreador, he thought–she waved and ran off. He watched her high-heeled boots as they clicked on the tile. Saved, he thought, by an audition. He wondered how much longer she was going to pursue this dream when he knew for a fact that her father gave her the money for rent half the time. Darcy was forty-five if she was a day, funny at times, and excelled at talking his ears off when she wasn’t auditioning or rehearsing. When he reached number five, he saw the door open very slowly, the hinges squeaking and making his neck shiver. He had some WD40 in his car so would get it later. Pops hesitated, then looked in. Mrs. Lansing worked and her door was always locked; she mailed her rent. “Mrs. Lansing?” He called out in a loud voice, alerting whoever it might be. The voice was not known to him. A cleaning person? It was light and soft. He tried to think if Mrs. Lansing had anyone who she was close to but couldn’t recall; it was likely she never said anything about her life beyond her job. She was an RN, and she was often working extra shifts at the hospital so she could buy a condo, she informed him, before she hit retirement age. Ten more years to go before the deadline was up. Pops waited a minute and when there was nothing more forthcoming, he put his head into the living room. A woman had her back turned. She looked like she was getting ready to go somewhere. She had a dark skirt on with a white blouse and somehow Pops thought she looked professional. But different. He cleared his throat. When she turned round, he caught his breath. He recovered as she nodded at him, a warm smile wreathing her face. The truth was, Francine Nording was breathtaking. Not Hollywood pretty, not beautiful like his wife admitted she’d wanted to be as a kid. This woman deeply glowed. Her skin was ivory, her hair a white-gold and she was tallish and slender and held herself as if she was royalty. Maybe she was, he thought with a stab of panic and then felt foolish for everything he felt. Get a grip, he told himself. She held out the rent. They stepped into the hallway and she locked the door. He had the urge to take her elbow, guide her gently. “No, just the rent. Good to meet you. Tell your mother hello.” He flushed. He barely knew Mrs. Lansing after three years. He stifled the urge to watch her go down the stairs, then moved to the next door. He rang the bell but it didn’t make a sound. He knocked four times and it swung open. Waldo Zuma handed him a wad of bills which Pops shoved into his pocket. Wally shook his head, mouth a tight line. Pops ran down the stairs, passed Thomas in the front hall, then was out the entrance. He looked up and down the street. He studied the words painted on the cement half-wall. In the distance he could hear music and people calling out. He felt pulled to the park, wanted to see what the commotion was about. All the while he scanned passersby to see if she was among them. Yes, that Francine. When he got there, he was winded, sweaty, so he sat on a bench and mopped his face. The music was something spacey-jazzy, maybe it was all the rage, and a radio was turned up loud as could be. There was a circle of people near the fountain. Pops made his way to the edge of the crowd, then wormed his way through. It was Francine Nording. And she was dancing in that slim skirt and white shirt, her arms and legs moving in ways he had never seen before. She was lithe and elegant, lively and joyful and sparks were coming off her. She was like liquid energy as people watched and clapped. A clot of teenagers were dancing near her, free-form he guessed, whatever that fancy stuff was but even though they did amazing contortions they didn’t hold a candle to Francine. Not one bit. Everyone was mesmerized. It was one of the most moving things he had ever seen. Like seeing someone share being in love. A woman in street clothes, moving to sweetly crazy music, her body a ribbon of light, hands speaking, feet mixing up patterns in soft shadows on the sidewalk, the fountain rising into sunshine that was cheering her on. Did Francine paint those words on his property? Did the kids tell her what he said and then ask to meet them because she was a conduit of the dance, all wonderful with lively ways and an exotic existence? Pops didn’t care how it all came to be. He just let himself surrender to her wiles, felt himself lift off to another world, another way of being and called it all very, very good.